Hard as it is to believe, I have a few extra chocolates lying around. Because it’s almost summer and I’m getting ready for my very own mash-up – An American Under a Hot Zinc Roof in Paris – I need to start using up all of my chocolate, pronto, before the annual summer meltdown commences. Sometime a while back, I recall reading about a Frrrozen Hot Chocolate served at Serendipity in New York City. The recipe was published in a variety of places, and what stood out for me was the fact that it called for using ‘chocolates’ in their beverage. As in dipped chocolates, not chopped up chocolate. Unlike other people who wax nostalgic, I don’t have any memories of Serendipity, fond or otherwise, but I imagine they came up with the idea of using chocolates in a beverage as a way of taking care of scratched or dented leftover chocolate they might have had around. Either than, or before they opened in New York City, the shop was located in a small, rooftop apartment in Paris with a zinc roof whose internal temperature regularly zooms well above 100ºF (38ºC) in the summer. And as much as I liked the idea, their brew called for a scant amount of “hot cocoa mix”, just 2 teaspoons and that just doesn’t do it for me. Why use “mix” when you can just take the express route and use cocoa powder? So I got a little serendipitous and piled in a lot more chocolates than were called for. Heck, I pretty much skirted the entire recipe and just added what I thought would make a decent iced chocolate; a small box chocolates, cocoa powder, milk, and a few scoops of ice cream or sorbet. Inspired by a drink served from SerendipityIf you don’t have any spare chocolates lying around, you can use the similar weight in dark chocolate. I used ice cream or sherbet but if you want a lighter beverage, you can make it without. I like the richness and the extra-chill. 1. In a small saucepan, heat two-thirds of the milk with cocoa powder, just until it begins to boil. 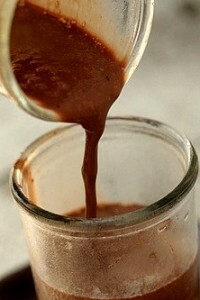 Remove from heat and drop in the chocolates, stirring until the chocolates are melted and smooth. Let mixture cool to room temperature. 2. 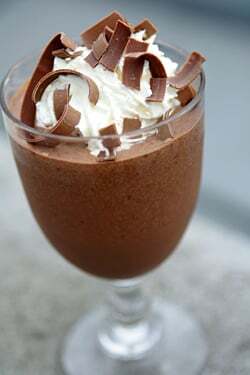 Using a blender, mix the chocolate mixture and the rest of the milk with the ice cubes and ice cream or sorbet (and Kahluà or espresso, if using) until completely smooth. 3. 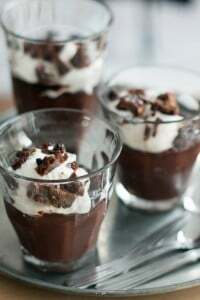 Divide into two glasses, top each with whipped cream and shaved chocolate. Oh my this is super decadent.Must try this out sometime. Enjoying your post. Looks perfectly refreshing and super easy. I want to go make it right now! Only the other day did I read of another Hot Tin Roof tenant, exclaiming “Time to put the chocolate into the fridge” (http://phillipprideaux.blogspot.com/2011/06/time-to-put-chocolate-in-fridge.html)! I am a big fan of Serendipity’s Frozen Hot Chocolate. I thought it was perfection. But I think you just improved it. Wow. I’m cursing you from the land of chocolate over here. I sure hope for my sake it’s as difficult to find unsweetened cocoa as it is to fine 100% unsweetened chocolate here. Its hard to believe but for a long time I couldn’t find 100% unsweeted chocolate in Switzerland. Ok, not in the usual spots anyway where I found 98% unsweetened, but I wanted 100%. I have to go to the specialty chocolate shops if I want to find it. I’m crossing my fingers I won’t be able to find the unsweetened cocoa in the usual spots either, but something tells me that will be easier. And I’ll be forced to make this. Miam this looks amazing. If only I had a blender! What a great idea to use left over chocolate! Although leftover chocolate is yet to be found in my home ;-) But I will sure try this recipe, with or without left over chocolate! My kids are always asking me for hot chocolate in the middle of summer (they are crazy) I’ll have to tuck this little gem in my back pocket for the next time that request is given. It will really send them for a loop though…mom? Actually giving them what they ask for? They won’t know what to do with themselves. I grew up on Serendipity’s Frozen Hot Chocolate, when nobody but New Yorker’s had ever heard about it. I love it but think there is always room for improvement for anything, especially when chocolate and David Lebovitz are involved. What do you mean you have a few chocolates lying around? I don’t know where you get the self control to actually have any leftover chocolate. The only chocolate I have that I can’t seem to get rid of are the unsweetened chocolate bars that I bought in a frenzy. Maybe I am not normal, but those chocolates would be gone before I finished typing about any extra chocolate. Wild Dingo: Just about any supermarket carries unsweetened cocoa powder. (Which, of course, is different than hot cocoa mix.) But it’s pretty available and if you live in Switzerland, a supermarket like Migros would certainly carry it. Nuts about Food: I’ve heard it’s very good but am wondering about the recipe that was going around. I used half the amount of milk, and dialed up the chocolate (and omitted the scant amount of hot cocoa mix.) But was wondering if anyone has made the original recipe that was published-which I linked to in the post? With the Kahlua in here I am 100% sold. This sounds fantastic for the 90 degree weather we will have today. Just yesterday I bought half a kilo of bittersweet chocolate (what do you think about Callebaut chocolate? This is the first time I have bought it) and I can’t wait to try this. oh i had no idea Serendipity used chopped up chocolates in their famous drink, i always imagined they did something secretly strange to the “hot chocolate mix” – but this is genius. never would have thought to used boxed chocolates – also i guess because boxed chocolates would never last long enough to do anything with them but stuff them in mouth pronto. I went to school in NYC (a dozen years ago, eek!) and it was always a special treat as a starving student to visit Serendipity 3. Sometimes the line was hours long — that John Cusack movie didn’t help matters — so I am absolutely thrilled to be able to reproduce the drink in my Boston kitchen. Thank you for the food memories. Oh I’m a sucker for iced chocolate. My favorite, though, is LA Burdick (there’s a cafe in Boston and one in New York too) — The quality of their chocolate is excellent. This looks so tasty and refreshing! Thanks for sharing the recipe! When I make your ice cream or sherbet recipes, I flirt with the idea of the ultimate milkshake, but then I usually desist thinking it would be a waste of awesome ice cream. It looks like this recipe will break that barrier. Accompanied by the B & W cookies that I made from Ready for Dessert last night? A tribute to New York bliss! Thanks for sharing! This looks like pure summery chocolatey perfection. I’ve always wanted to go to Serendipity, but now I can wait with this recipe! Hmmmmm! Sounds delicious! I want some! Thanks so much for sharing! Definitely a great drink for this early warm summer. Did you make your own shaved chocolate? 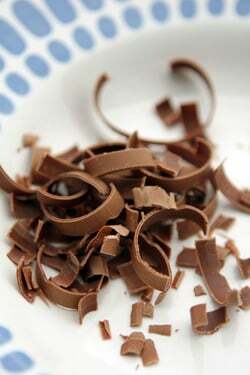 Do u have somewhere in your blog talking about how to make these little garnish chocolate so nice? Appreciate if you do have one ! Dave…. Frozen hot chocolate now available at Dunkin’ Donuts !!! Who knew ?? This looks fantastic! I’m afraid if I make this it’s going to be a regular treat…maybe for my swimsuit’s sake I should wait until the end of summer to give this a try…. Hmmm, yeah, not going to be able to resist that long! Charizze: I took a sharp vegetable peeler and ran it down the edge of a bar of milk chocolate to make those. It’s easy! OMG – looks and sounds absolutely out of this world! I’m in Washington DC, where heat set a record yesterday and will probably do so again today. I remember Serendipity fondly – spent many happy hours there as a teen. I’m thinking of making this for breakfast. Would it be a crime to make recipe for 2 and drink/eat both myself? It’s already 81 F in DC and it’s not even 9 am. I believe this could qualify as “breakfast” on day like this. It has lowfat milk. That’s a breakfast food. Perfect for a hot, Florida summer day! David, you always come through for us! Such a pleasure. 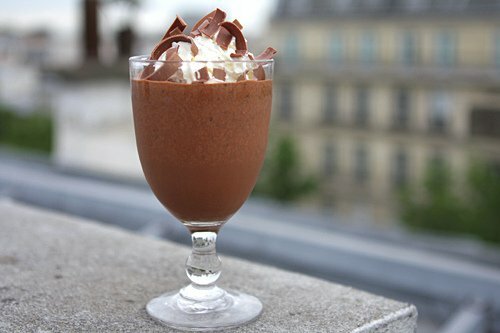 Perfectly right to go for the cocoa and the ice cream/sorbet, and charming to transform it all into a super shake. Your icy, ice cream version sounds like the hot weather counterpart of the hot chocolate. Here in the SF Bay Area, we get some cold days in summer and warm ones in winter, so I am happily mixed up and able to enjoy hot or iced chocolate the year round. A frozen hot chocolate at Serendipity brings back such memories! I had completely forgotten about them. Growing up, it was such a treat to go there, after a trip to Bloomingdales. What are you trying to do to me? You know how revealing summer attire can be?! This looks beyond the steeliest will power. Your blog often leaves me wishing I too was living a sweet life in Paris. But I sink down to reality a bit considering your scorching hot tiny kitchened broke regularly broke elevator pricey apartment. But it looks adorable too, but I just don’t know if I could give up my cool roomy digs. But I am so glad you could, because your blog is delicious. When I plan on making milkshakes (which I always do when we have burgers!) I make creme anglaise to mix with your chocolate sauce in the blender. I really like how well your recipe for the sauce suspends in milk and even more so in creme anglaise. Makes the perfect shake. Thank you for including an option for those of us who have never in their life had extra leftover chocolate lying around. This weekend, I’ll serve this in a beautiful glass for a summer dinner party dessert – just add shortbread cookies and sugary, spiced pecans. I never had any leftover chocolate but I think I need some to make this. wow…that looks so friggin good! Also, I just want to let you know I love your book, Ready for Dessert! I got it recently and I’ve already tried a few of the recipes and have a list of others I’d like to try. What a terrific investment (which is not something I can say for every cookbook I’ve bought)! Thank you! I’ll pay you five million dollars to trade metabolisms with me. My husband makes me something simliar, but he uses ice cubes made from our leftover coffee. I think you might like it that way too! I clicked on your bookmarked page, saw that lovely glass of chocolate sitting all by it’s lonesome self and just said Whoa! I think I went into chocolate coma just reading the recipe! It’s all June gloomy in LA right now, but dreaming of this on a hot summer day…divine! David, what do you mean by “dipped chocolates”? Are they filled with anything? Or are they just solid chocolates made to look fancy? @witloof: You gave me my laugh for the day. This is fantastic. I just got a box of ferrero roche chocolates. And I have a bag of truffles. My mom would love this too. I’m so excited! No wonder Tim Horton’s has gotten in on the frozen hot chocolate trend. Serendipity restaurants in NYC makes a great one obviously. I eat it when I want an ice cream substitute and something chocolately and cold. Thanks for the great recipe! I too have heard of the Hot Chocolate from NY Serendipity. It is on my bucket list – to have their wonderful hot chocolate (there is also one with spicy chillies that I want to try) while the NY snow falls and then go ice skating under the Rockefeller Xmas tree. 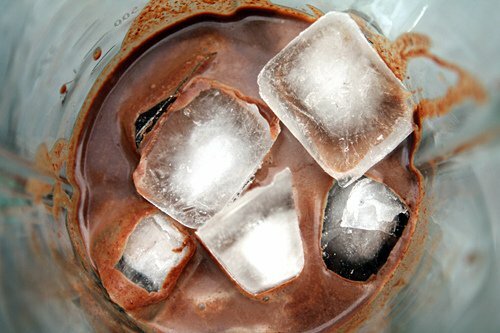 I will definitely be making this iced chocolate this summer and enjoy it under the Okanagan sun with a book. Do you think truffles would work as the chocolate? I’m not sure since the texture is so different. I have an obscene amount of truffles on hand and if I bring any more to work…my coworkers will kill me. It would be nice to “re-purpose” them! Well, every major milestone in my childhood was celebrated at Serendipity’s, and although it was the Frozen hot chocolate that made them famous, it was their hot fudge sundae that kept me coming back. When I was 8 1/2 months pregnant, I went back and ordered a bowl of chili and the sundae– the looks are still memorable 21 years later. The lines were crazy long there even back in the 70’s, before the movie. And frankly, the frozen hot chocolate was a big reason, in addition to the host with the handlebar mustache, the Tiffany lamps, and all the cool trinkets one could buy. Thanks for the recipe- I never saw the printed one, so this is a coup! I guess my first comment must have melted off the screen ( see above ). This is day 13 of 90+ degree heat here in Hotlanta and as I was sitting at my desk this afternoon, sipping my lukewarm Vitaminwater Zero, I came across your photo of the Hot Frozen Chocolate and just about cried! I am going crazy from this heat and can’t wait to have something cold, sinful, and delicious to keep me from going over the edge. I will have to buy some chocolate, because me saying I have leftover lying around the house is just crazy talk. Wow David, I just found your blog and I absolutely love it. Keep up the good work! Mmmmmm! The chocoholic in me is screaming, “Yeah! Hooray!” I have one little tip to pass along. I find that heating milk and cocoa powder results in tiny granules of cocoa powder forming even though you stir. However, if you put the cocoa powder in a cup or glass and stir in just enough hot milk to make a smooth paste, you can then stir in the remainder of the milk and have a perfectly smooth mixture. Hog diggity! Left-over chocolate finds a home. Nice story. And I have the same question as the Alyssa – can you use um, less than superior chocolates? I’m sorry, but I’m having problems with the term someone used earlier – ‘left over’ chocolates. That makes no sense at all. On the other hand, this looks splendid and the kind of refreshing beverage that should be available on every street corner. This a great way to use the 75% and 90% off chocolate bunnies I bought after Easter. When I was much younger, I bought Christmas M & M’s and separated out the red and green ones. I brought the red ones in to school on Valentine’s Day and the green ones in on St Patrick’s Day. ooo, now this is a keeper. what a fantastic idea, and so refreshing too for summer! i will definitely be making it soon. You are one crazy dude. 8 chocolates, 3 scoops of ice cream. I have no further words. Wow, this is my kind of chocolate treat! 2 ounces of bittersweet chocolate, 1/2 tablespoon of cocoa powder, and 1 and a half scoops of chocolate ice cream per serving. What a great way to refresh ourselves in summer. J’adore! WOW!!! These are … decadent and divine! I blend and make a lot of smoothies in the summer. My blender is about to thank you. Wow! Admittedly, I deviated from the recipe a bit because I just used what I had on hand, but it was divine. So so rich! (I ended up using vanilla ice cream because I didn’t have any chocolate). I used some really not so great chocolates I had lying around, so I’m really excited to make this again with some very nice chocolates and with the chocolate ice cream. David – when measuring out the ice, did you base the 6 ounces on crushed ice or cubed? I just measured out about 6 ounces of cubed ice, but I feel like it might have been better with a little more ice (it was a bit runny). I think you made the right move with pitching the original and going au natural! I would have done the same thing! Great stuff! David you are a good resource for chocolates. We dragged our flu-sickened bodies to the Ferry Building in SF and bought some Recchiuti Asphalt Jungle mix. They don’t want to give you a cute bag unless you ask for it. More crazy! Many thanks! I agree with you Steph, I used whole ice as well and it came out a bit runny…..still tasted good though! mazz: The first edition is the hardback. I made some updates to the list of Paris addresses in the back of the book for the paperback edition. Steph & Mex Vanilla: It’s not supposed to be a milk shake, it’s more of an iced chocolate beverage. That said, I did choose to add ice cream to the drink because I wanted it to be a little rich, but not too much. Dianne: Yes, truffles would work great! I’ve gained 8 pounds reading this post. You have a lot to answer for! Sounds absolutely fab!! Dunkin Donuts has iced hot chocolate this spring as one of their new seasonal specials being advertised. I want to try some or will make yours, but am a bit hesitant after dropping about 20.
what a perfect way to cool off for the summer! I can’t say no to chocolate, let alone iced chocolate. I love that you improvised and changed up the recipe to suit your tastes (and your cabinet). This completely reminds me of some delicious gourmet sipping chocolate! 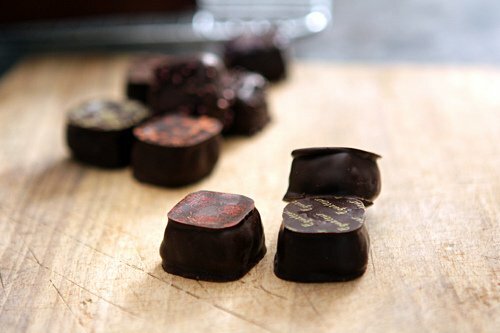 Have you considered using dark chocolate? Most recipes use bittersweet chocolate but I’d like to see someone incorporate dark chocolate into the mix! 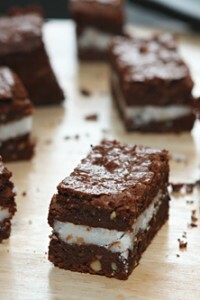 sounds amazing, i may have to adapt the recipe to make it dairy free. thanks! Has anyone tried this and found a way to make it and just freeze it for later? For example, where would be a good place to stop and freeze things, if I were to make this ahead of time, and add the ice in at the end? This would be AMAZING to have one hand for the end of a long day. Once again, sounds amazing, David!